…This little piggy stayed at home. Confused? Well, aside from reciting nursery rhymes, we are delighted to announce that, very soon, you will be able to purchase a brand new range of porky treats from your local supermarket, to enjoy in the comfort of your own home. Lee is the owner of The Crown and Pig on the Hill. Cheeky, creative and clever, this little piggy has more ideas than you can shake a sausage at. The perky pig who can do it all! Jake is Lee’s right trotter man and brings calm to the chaos. Since he left Uni, Jake has been developing the businesses alongside Lee. The visionary creative force in the kitchen, Tom is The Crown’s resident chef. You’ll find him experimenting with fantastic foodie ideas to tantalise your taste buds. It all began one night in The Crown, a quintessential Cotswolds pub. 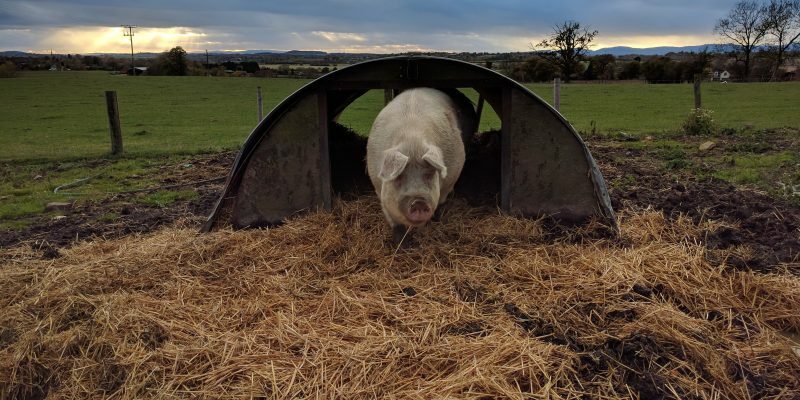 A foodie conversation was had and one loyal regular, Mr Rich Hill, was heard to proclaim: “ You can keep your oysters and Champagne; give me a packet of pork scratchings and a pint.” This gave our three pigs an idea: Why not create a range of bar snacks using local produce? Lee and Jake have spent the last seven years shaping Pig on the Hill into the successful business that it is today. No strangers to pork, the pair take pride in supplying premium product to the consumer who appreciates fine food. The meat is locally sourced from Meadows Farm in Bredon’s Norton; a magical place on the slopes of Bredon Hill. The pair began supplying pig roasts to weddings and this rapidly progressed to mobile bars. Now catering for upwards of 4,000 guests at events up and down the country, Pig on the Hill has a well-deserved reputation for success. This expertise works in harmony with Tom’s culinary genius. As a student, Tom took his first steps into a kitchen to earn some money. It was at that point he was bitten by the bug and has never looked back. After leaving Uni, he had various kitchen jobs, eventually arriving at the award-winning kitchen of Cliveden House in Berkshire. After six years, he held the prestigious position of Sous Chef – second in command to the Head Chef. With a desire to travel, he then went backpacking around Australia, working in various kitchens along the way. On his return to the UK, a friend told him that The Crown were looking for a Chef… and the rest is history. Months of research and development have taken place in order to produce the perfect porky range of high-end bar snacks, and we invite you to join us on our journey over the next few months. We can’t wait to share the next steps with you as we work towards bringing our piggy snacks to the retail market.